Hillary Clinton has won Kentucky's Democratic presidential election primary by a large margin. Voters are also going to the polls in Oregon, where surveys suggest Mrs Clinton's rival Barack Obama will win. If Mr Obama performs well, he could win a majority of the elected delegates who will choose the party's nominee at the Democratic National Convention. Hailing her Kentucky victory, Mrs Clinton vowed to fight on "until we have a nominee - whoever she may be". Speaking to her supporters at a rally in Kentucky, Mrs Clinton said: "It's not just Kentucky bluegrass that's music to my ears, it's the sound of your overwhelming vote of confidence, even in the face of some pretty tough odds." And in a passage seemingly directed at the remaining undecided super-delegates, Mrs Clinton argued that she would be "best positioned to win in November" against Republican candidate Sen John McCain. Mrs Clinton also said she was "winning the popular vote" over Mr Obama. The claim has been questioned by the Obama campaign, which argues that Mrs Clinton's popular vote calculation includes disputed contests in Michigan and Florida, and does not include results from several caucus states in which Mr Obama did well. 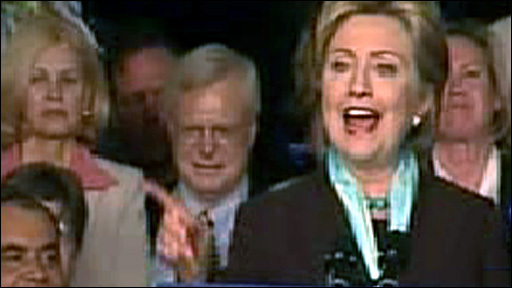 With more than 97% of Kentucky's precincts reporting, Mrs Clinton had won 65% of the vote, to Mr Obama's 30%. In the primaries so far, Mr Obama has secured more of the delegates who will choose the party's nominee at the Democratic National Convention. With very few delegates still to be won, correspondents say it is highly unlikely Sen Clinton can catch Mr Obama. 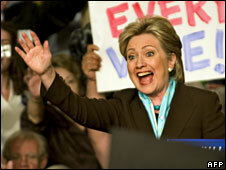 Mrs Clinton insists the race is not yet over, but BBC correspondents say Mr Obama is keen to suggest the opposite. Tuesday's primary votes are unlikely to push Mr Obama over the 2,026 overall delegates needed to win the party's nomination. However, he is expected to secure a majority of the "pledged" delegates - those secured via primary votes - at stake. This milestone could encourage those super-delegates who remain undecided to back him. Voters in Oregon, which has a mail-in voting system, have until 2000 local time (0300 GMT) to return their ballots to election offices. Mrs Clinton has warned Mr Obama against declaring premature victory, saying it would be a "slap in the face" to her millions of supporters so far and those states yet to vote. Mr Obama's aides are increasingly pushing the message that he has all but wrapped up the Democratic nomination and will be the one to face Mr McCain in November's general election. "As we near victory in one contest, the next challenge is already heating up," campaign manager David Plouffe wrote in an e-mail to supporters on Monday. "President Bush and Senator McCain have begun co-ordinating their attacks on Barack Obama in an effort to extend their failed policies for a third term." Mr Obama is due to give a speech in Iowa - scene of his first primary victory back in early January - before the results are even in from Oregon. The obvious intention, BBC North America editor Justin Webb says, is to suggest without quite saying so that the primary season is closing and the general election race is beginning. Our correspondent adds that although Mrs Clinton insists the race is still on, the truth is that the undecided super-delegates are moving steadily towards Mr Obama, with six more added on Monday according to the Associated Press news agency. Once the 103 pledged delegates at stake in Kentucky and Oregon have been divided between the two rivals, Mr Obama may be only 50 to 75 short of the 2,026 delegates needed, AP says. 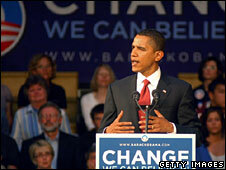 Mr McCain, senator for Arizona, has already begun targeting Mr Obama as his probable opponent in November. Monday saw him criticise Mr Obama over comments he made a day earlier suggesting that Iran does not pose the same level of threat to the US as the former Soviet Union once did. In response, Mr Obama said that while Iran was a "grave threat", it had no nuclear weapons whereas the Soviet Union "had thousands". Are you in Kentucky or Oregon? Are you voting on Tuesday? Do you think the outcome of these primaries will decide the Democratic race? Send us your comments using the form below.